News: Richard Branson's Virgin Galactic passenger spacecraft broke the sound barrier during its first rocket-powered flight in California yesterday. Virgin Galactic's SpaceShipTwo was brought to an altitude of 14,000 metres before being released by its carrier craft over the Mojave Desert. The pilots then rotated the spacecraft to a vertical position and ignited its rocket, which propelled it beyond the speed of sound and took it to almost 17,000 metres above ground. "The first powered flight of Virgin Spaceship Enterprise was without any doubt our single most important flight test to date," said Branson, the British entrepreneur who founded Virgin Galactic to be the world's first commercial space travel company. "Today’s supersonic success opens the way for a rapid expansion of the spaceship's powered flight envelope, with a very realistic goal of full space flight by the year’s end," he added. 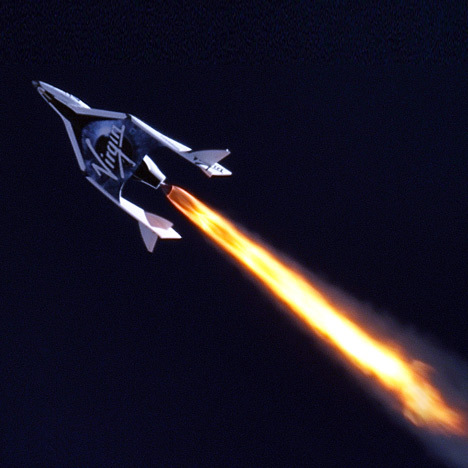 SpaceShipTwo is designed to carry two pilots and six passengers on two-and-a-half-hour sub-orbital flights and was unveiled in 2009, a year after its carrier craft WhiteKnightTwo was unveiled – see all news about Virgin Galactic. The Virgin Galactic terminal in New Mexico was designed by Foster + Partners, the British firm that recently announced proposals to 3D-printing buildings on the moon - see all news and stories about space. Top image is by Marscientific.com and Clay Center Observatory.